The YiA 2018 shortlisted finalists have been chosen – well done finalists! Our three judges decide who wins the YiA Intermediate, Junior and Senior first, second and third place prizes, but we need YOUR help finding our fan favourites across all three categories. 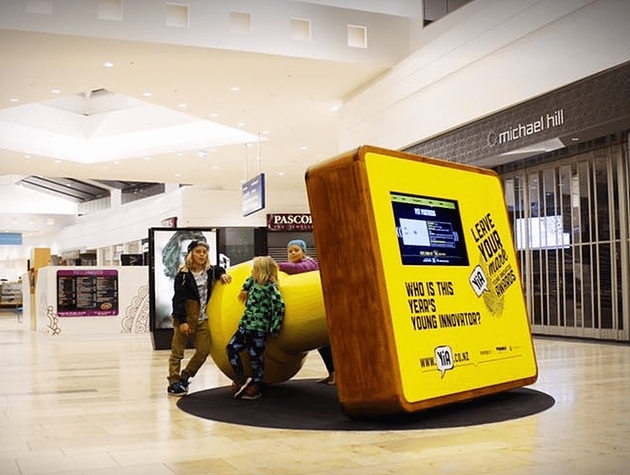 The giant yellow YiA stamp is back in action this year at Bayfair Shopping Centre for the Innovation Showcase. Head along - you can't miss it! Watch the videos of our finalists, get inspired by all our young innovators and VOTE for your favourite innovation. EVERYONE from you to your mate to your grandma is welcome to vote for the People's Choice Awards, so spread the word! WHEN & WHERE? 18th – 29th of August 2018, 9am-5pm at Bayfair Shopping Centre. ​WHY? To celebrate our YiA short-listed finalists and their amazing ideas and to help us find our three winners for the People's Choice Awards. ​WHAT? The People's Choice Awards provides an opportunity for the public to choose their favourite innovation across all three YiA categories. The winner in each category wins a $200 Bayfair gift card. Even the voters can walk away with a prize! Everyone who casts a vote at the Innovation Showcase will go in the draw to win one of two $50 Bayfair gift cards. See you at the Innovation Showcase!